These sturdy, high walled Gift Boxes with lids are ideal boxes to use, no matter the situation. From personal presents to corporate gifting, these two piece boxes are strong yet sophisticated, allowing you to put anything inside without the fear of the box breaking or your items being damaged. Gift shops, apparel stores and other high end stores would benefit from these amazing gift boxes. For your convenience, lids and bases are sold separately, allowing you the freedom to mix and match each box individually! Add a personalized touch by adding ribbons, bows & other accessories to each box. 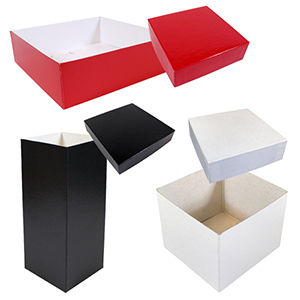 At American Retail Supply we offer Gift Boxes with lids in four different colors; White, Red, Gold & Black.